Place each foot into an Easy Grip Loop with one seal in between your feet. 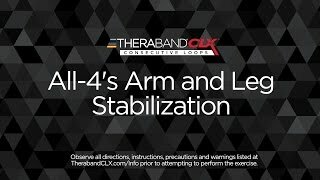 Place your hands into the last easy grip loops of the CLX. Assume a hands and knees position with your arms directly below your shoulders and knees directly below your hips. Simultaneously lift one leg and the opposite arm while maintaining your balance. When lifting, extend the leg until your knee is stratight and parallel to the floor while stablizing the CLX with your hands and opposite foot. Tip: Keep your head and neck in a neutral position throughout the exercise.